Founded in 1975, Damanhur is a Federation of Communities that brings together practical, spiritual seekers with a strong connection to magic, the Earth, and the evolution of humanity. Nestled in the Valchiusella Valley in Piedmont, Italy, between the cities of Turin, Milan and Aosta, it is well known for natural beauty and human-made wonders like the Temples of Humankind. Built entirely by hand into the side of a mountain, the Temples—considered by many the 8th Wonder of the World—exemplify the incredible feats we can accomplish when we come together for a common goal. The EcoCommunity has its own Constitution designed around spiritual principles, as well as its own flag and currency. It seeks to expand its vision and share its knowledge with the world to inspire individuals and groups to come together and create “community” (however they choose to define it). 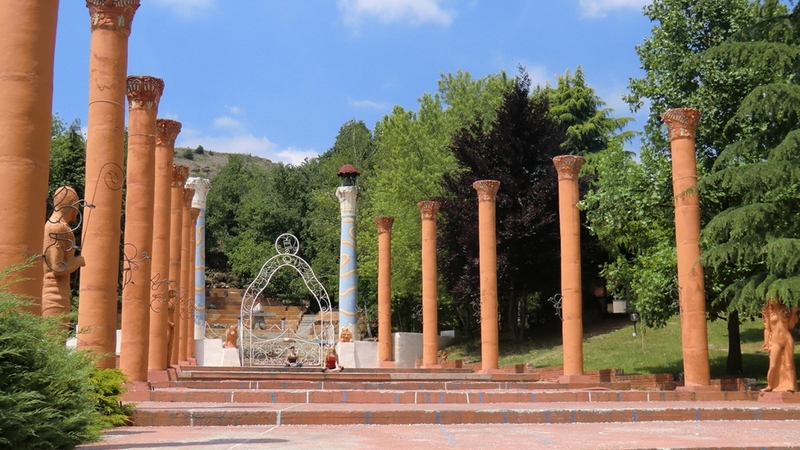 Damanhur has been recognized multiple times for its forward-looking efforts, notably in 2005 with the Award for Sustainable Communities by a group of the United Nations, and in 2008 for applying the Earth Charter, a 21st century vision for a more just and sustainable society. One way Damanhur spreads its message is via its Ambassadors—individuals with a strong desire to bring Damanhur into the world and passionately share its principles. Tigrilla Gardenia is one such ambassador. Today, she represents Florida locally and connection to the plant world globally. With a strong background as a public speaker, interspecies researcher, and affiliations with organizations like Cirque du Soleil and Microsoft, she integrates her enthusiasm for community into real-world experiences to inspire others to create the lives they have been dreaming of. Ultimately the goal is to spread Damanhur’s spiritual vision, knowledge and tools to as many local communities as possible to help others realize their personal and collective dreams. One need not live at Damanhur itself to experience its magic. Why connect to Damanhur in your city, you ask? Damanhur offers practical answers to existential questions. We have all taken courses offering personal transformation, how to find your mission, and how to tap into your personal power. But once you leave the course, alone to put into practice the myriad of information, enthusiasm fades rapidly. Damanhur doesn’t want to just give you tools, instead it is about creating the community so that when you need help, there is always someone there. More than that, every person acts like a mirror to help you see pieces of yourself hidden under the conditioning from your past lives, family culture and societal norms. Together, we bring to the surface these pieces and support their transformation. Damanhur is a place where you can go—physically or virtually—any time you want to see what life is like if you were to really put into practice all the learnings you have acquired. A place where temples are not artifacts of the past, but the results of a living people. A place where alchemical work creates business relationships and connects you to the divine. Don’t expect to be told who you should be or what you should do. The Damanhurian philosophy is about remember-it-yourself so that you can do-it-yourself—with the help of others and lots of fun. When you reawaken the memories of your past lives by living these experiences all over again with a group of people, it becomes a part of your present life. When you learn how to distill a personal emotion into a potion, you enhance specific characteristics of yourself any time you need them. We can reawaken our divine spark and live with consciousness awareness. To do it, we need to free ourselves from the chains of our pasts and consciously choose the next step. Tigrilla wants to help you do just that. Contact her to connect to Damanhur. I hope to encourage your interest in Damanhur and its knowledge!